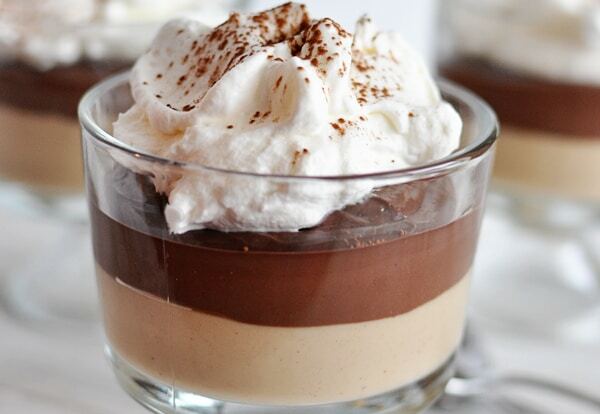 I know of no better way to start off the week then to spend 24 minutes or so staring at pictures of layered peanut butter and chocolate pudding. What about you? My cousin Tami (who has bequeathed me this recipe and this recipe and this recipe among others) sent me this recipe after her awesome, teen daughter, Faith (hi, Faith! ), made it for their family. Words like “amazing” and “life-changing” and “best dessert ever” graced the email. I mean, really, what’s a pudding-loving girl to do when faced with temptation like that? 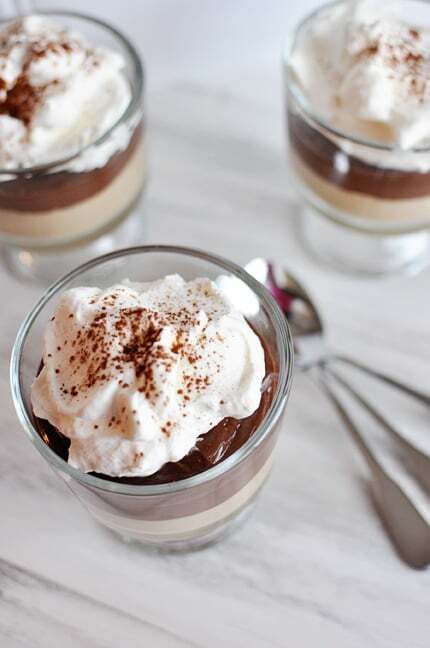 Simple in concept and brilliant in presentation, these delectable pudding cups are creamy and decadent and have the perfect contrast of rich chocolate pudding and lighter peanut butter pudding. Oh and don’t forget the healthy dollop of sweetened whipped cream. Yes, please. Cute as can be in cups, Tami informed me that she has since ditched the cup presentation and gone straight for the pie. I’ve included details in the notes of the recipe so do whatever floats your boat but keep in mind that you really can’t go wrong with this stellar combination. For the peanut butter pudding, whisk the sugar, cornstarch and salt together in a large saucepan. Gradually whisk in the milk and cream. Over medium heat, cook the pudding, whisking constantly, until it comes to a boil and large bubbles pop at the surface. Boil until thick, whisking constantly, about 30 seconds. Whisk in the peanut butter and boil until thick again, whisking often, about 1 more minute. Remove from heat and whisk in the vanilla. Divide the pudding among six 1-cup glasses or dishes (it should be about a heaping 1/3 cup each). Chill uncovered while preparing the chocolate pudding. For the chocolate pudding, whisk together the sugar, cornstarch, cocoa powder and salt together in a large saucepan. Gradually whisk in the milk and cream. Over medium heat, cook the pudding, whisking constantly, until it comes to a boil and large bubbles pop at the surface. Boil until thick, whisking constantly, about 30 seconds. Stir in the chopped chocolate. Boil until chocolate melts and pudding is thick again, whisking often, 1 to 2 minutes longer. Remove from the heat and whisk in the vanilla. Cool the pudding for about 10 minutes. Spoon a heaping 1/3 cup of the chocolate pudding on top of the chilled peanut butter pudding. Chill the puddings uncovered until cold, at least 2 hours. For the whipped cream, beat the cream and powdered sugar in a medium bowl with an electric mixer (or I like to use my Blendtec) to soft peaks. Spoon topping onto puddings, dust with cocoa powder, if desired, and serve immediately. My cousin, Tami, who referred me to this recipe said after making it in these delightful little cups, they decided to try it in a pie and it's the only way they eat it these days. 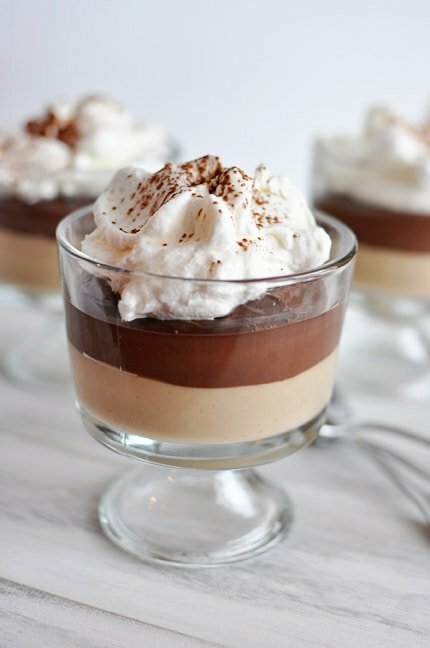 She uses a graham cracker or oreo crust and layers the peanut butter pudding (and chills it like in the recipe), then the chocolate pudding and chills it before adding the sweetened whipped cream. The pudding (whether in cup or pie form) can be made up to a day in advance and chilled in the refrigerator. Also, the original recipe uses whole milk which I never have on hand so I made it with 1% and while it was probably slightly less rich and creamy, it was still delicious, so I've changed my version of the recipe to call for anything from 1%, 2% or whole milk. Thank you so much for this recipe! My sister wanted chocolate peanut butter pudding pops. I used your recipe in our popsicle mold and it turned out amazing! Made this over the weekend… I didn’t realize they were going to be so rich! I couldv’e spread them out over several more dishes. Really, really good! We made this today as a pie and it was DELISH. More than made up for the disappointment of the chocolate tres leches cake. Yecch. But be forewarned: the pudding, once we sliced into it, ran all over and scooped into bowls, became more of a trifle than a pie. But no complaints here! These look great. And I must admit, nothing tastes as good as the food my teenagers (occasionally) make for me! These were amazing. The only substitution I made was using semi-sweet chocolate instead of milk, but that was only because that’s what I had on hand (prefer semi-sweet to milk anyway). 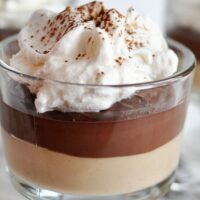 “I know of no better way to start off the week then to spend 24 minutes or so staring at pictures of layered peanut butter and chocolate pudding.” Except maybe staring at cups of layered peanut butter and chocolate pudding? Though, the pudding cups probably wouldn’t last 24 minutes . . . 😉 Thanks for your great site, Mel! Yum! I love your regular chocolate and vanilla puddings. They are divine! Will have to add these to our dessert rotation 🙂 Thanks Mel and cousin! This sounds like exactly what I need today! These puddings are so good. If I use a store bought crust I usually half the puddings or pour the rest in bowls. Yum. This sounds so good to me. Except I can’t do peanut butter-I’m allergic to the max. I wonder how it would taste with creamy almond butter instead? I can substitute almond butter for peanut butter in some recipes, and it works just fine. Others not so much. Anyway, what do you think? junecutie – I’ve never made the pudding with anything other than peanut butter but the almond butter sub is definitely worth a try. There´s something so comforting and attractive about pudding, it´s funny that I haven´t made one in ages. I will try the pie version of this recipes, it sounds fantastic Mel! And I still have homemade graham crackers that I need to use. Anything involving chocolate and peanut butter is my kind of dessert! Looking forward to trying these! What can replace the cornstarch? Because of GMOs I no longer use corn starch, and haven’t found an appropriate substitute. Thanks to anyone who can answer!! Heather – buying organic cornstarch or non-GMO cornstarch would eliminate this issue (I’ve seen it labeled that way at larger health food stores and online). This looks delicious, any help for those with dairy issues? I can tolerate cream with a lactaid pill, but still can’t handle milk–any idea if rice or almond or coconut milk would work? Amanda – I haven’t made milk substitutions with these pudding recipes but it’s definitely worth a try.